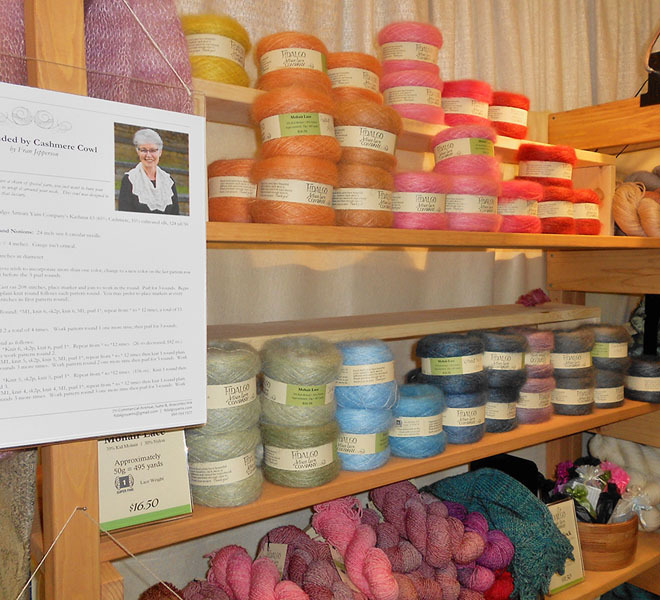 Taking a short break from ducks and ice crystals, I headed down to Tacoma, Washington to attend Madrona – a knitting and spinning retreat. Madrona is like graduate school – with superb teachers, advanced topics, and serious students. For me, it’s a treat to spend a long weekend with other crafty people, sharing and learning and inspiring one another. 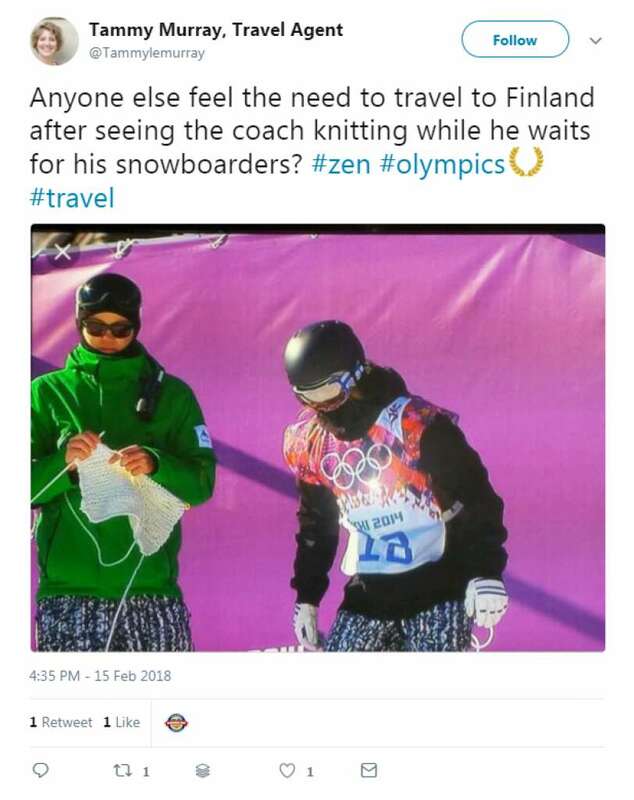 If you don’t think knitting is cool enough to blog about, just check out this picture I found from the Winter Olympics. Knitters (and spinners) are women, men, young, old, and everything in between. 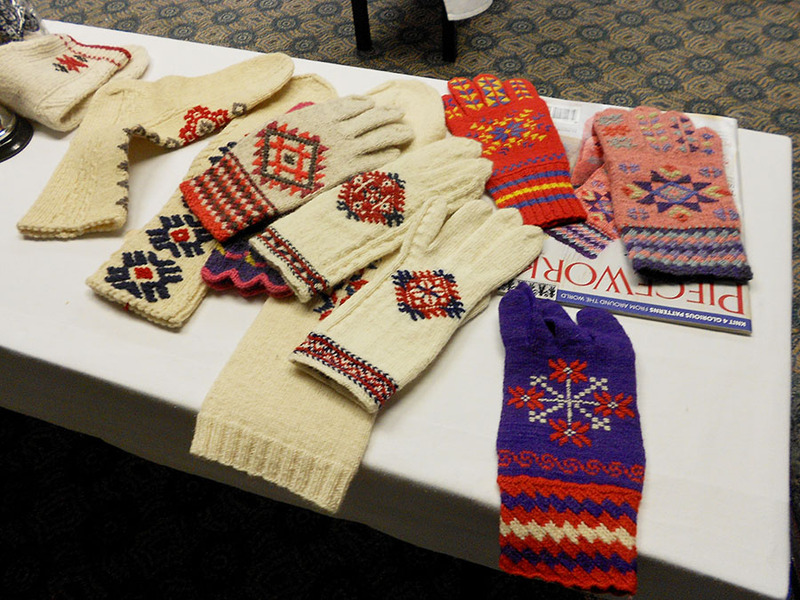 Everyone wears their hand-knits, and the variety is staggering, ranging from very traditional items to contemporary asymmetrical garments in vibrant colors. Everything goes. But the absolute BEST part about the knitters and spinners is the rampant kindness and consideration. The world needs a gigantic dose of knitterly polite-ness! People go way out of their way to be gracious to one another – it renews my faith in the human race. I think the reason for this is that a knitter (or a crafter of any kind) appreciates the effort another crafter puts into their creation. It might be the ugliest color or style you’ve ever seen, but the person who made the thing obviously likes it and worked hard to create it. 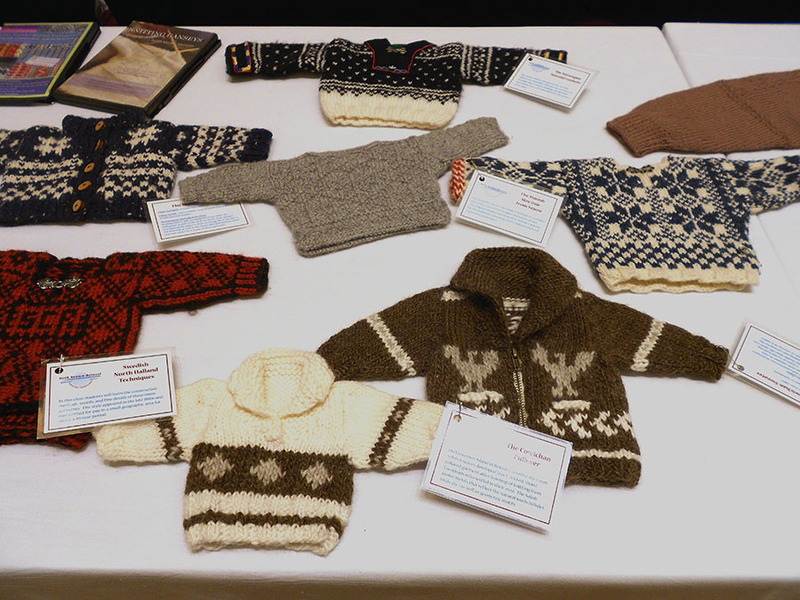 Knitters appreciate that effort and pride in the finished product – they express their genuine admiration based on empathy. This spirit of kindness and support creates a magical environment – it makes you feel like you can do anything. 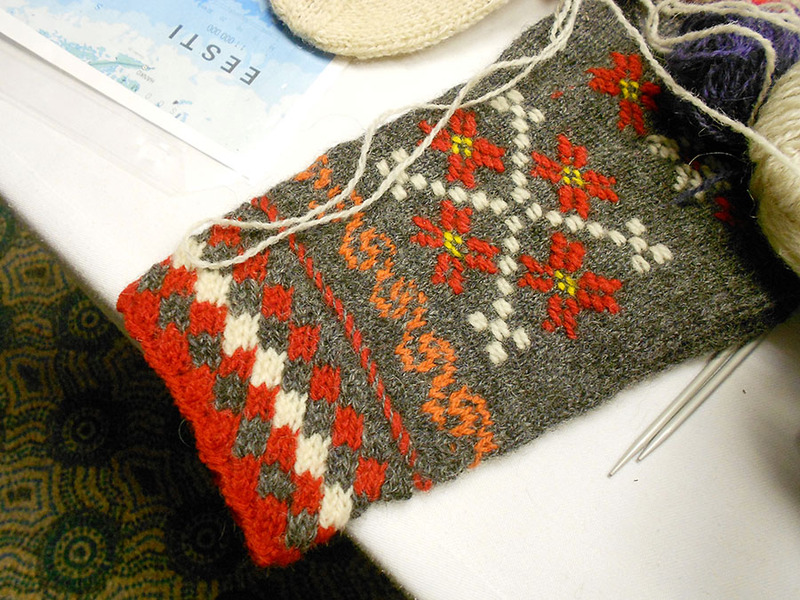 My first class was to learn about Roositud (pronounced “rosey tood”) – an Estonian inlay technique for embellishing knitted items. 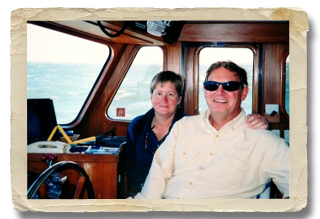 Here are some examples from our teacher Nancy Bush. 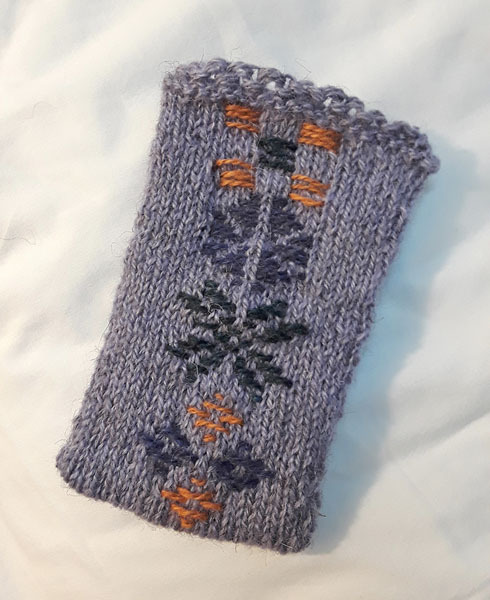 Each student got some different colored yarns, and we knitted little cell phone bags to practice creating the inlays. On a more serious project, we would probably use slightly thicker yarn to cover better, but here’s what my finished sampler looks like… I think I need a lot more practice! 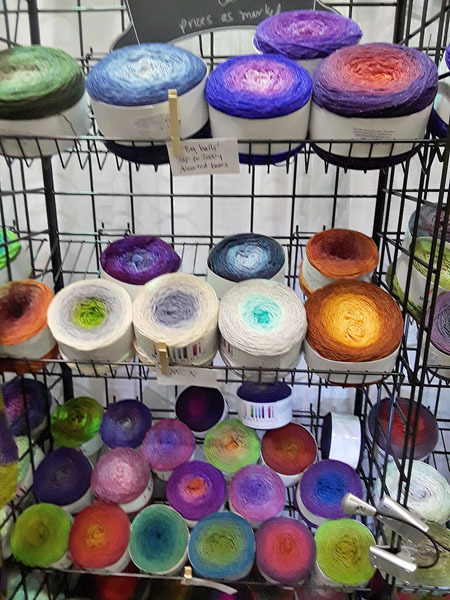 In between classes I enjoyed taking a break and drooling at all the pretty yarns in the marketplace… …and I actually resisted buying any (because I have plenty at home). The effects that dyers are creating these days boggles the mind. 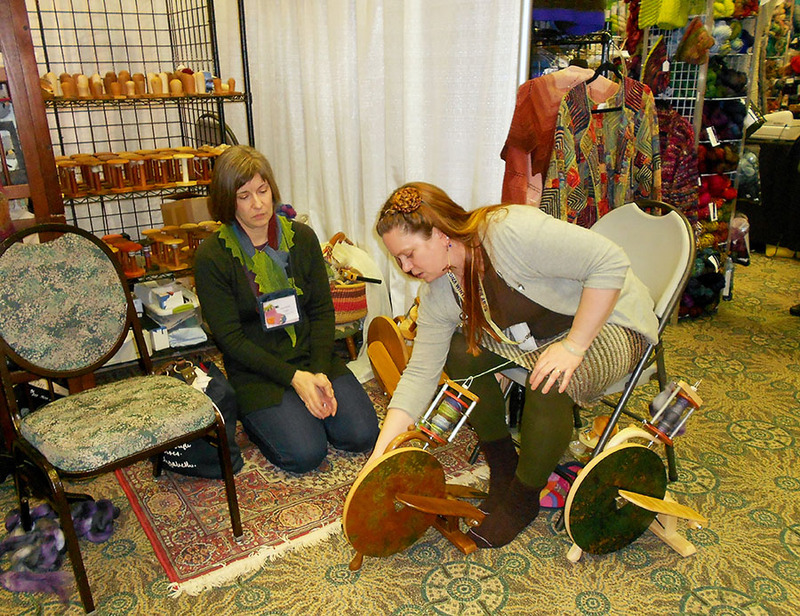 It’s also fun to see all the different spinning wheels – a lot of people spin fiber into yarn with a simple drop spindle, a traditional spinning wheel, or a small tabletop electric wheel. It’s not easy to travel with a spinning wheel, but plenty of people brought theirs so they could take classes, and it was interesting to watch people sit and spin by the hotel’s fireplace. 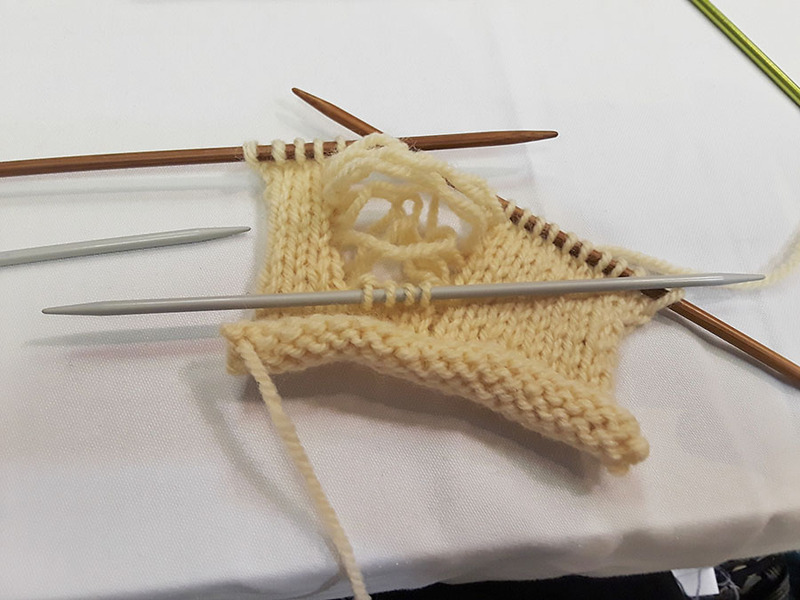 I took a class from one of my favorite teachers – Stephanie Pearl-McPhee – to learn to fix more complex knitting mistakes without unraveling days of knitting (which I have done plenty of times!). 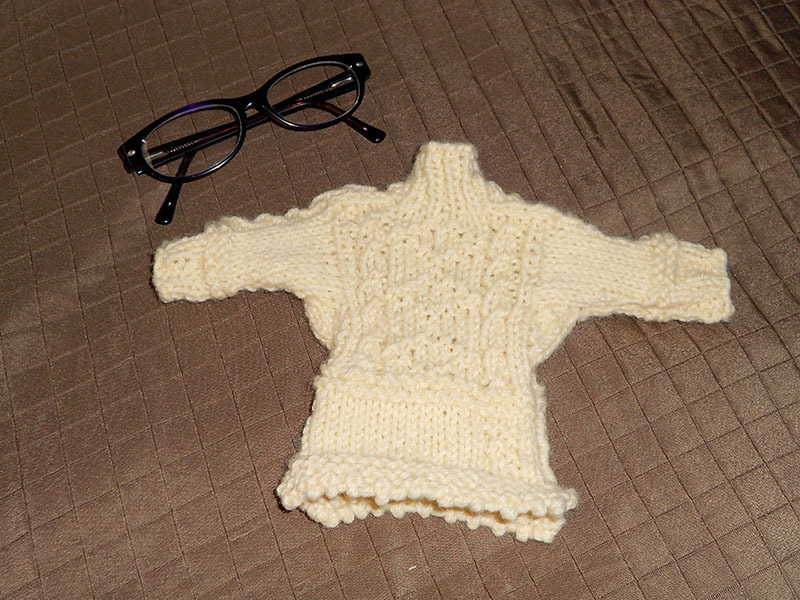 We started with a plain swatch of knitting and tortured it in various ways. What a confidence boost! There are so many things that can be fixed after-the-fact, even adding forgotten cables or lace stitches. It’s hard to believe that the mangled mess in the photo below was restored so you couldn’t tell that anything untoward had happened to it. It’s a big time-saver, and reduces the amount of salty language that is sometimes needed to get through the creative process. 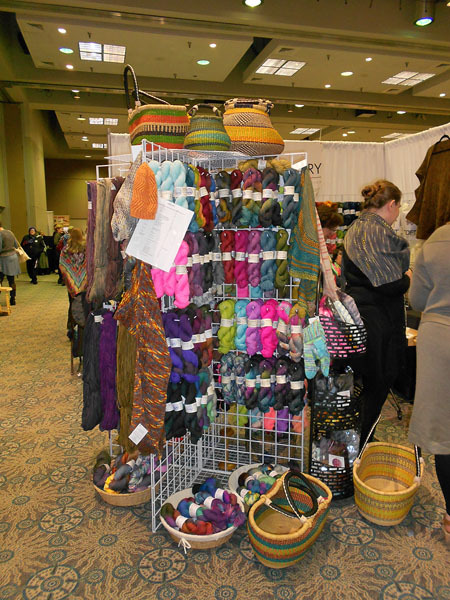 Near the yarn market was an open area for a variety of demonstrations and expert Q&A. 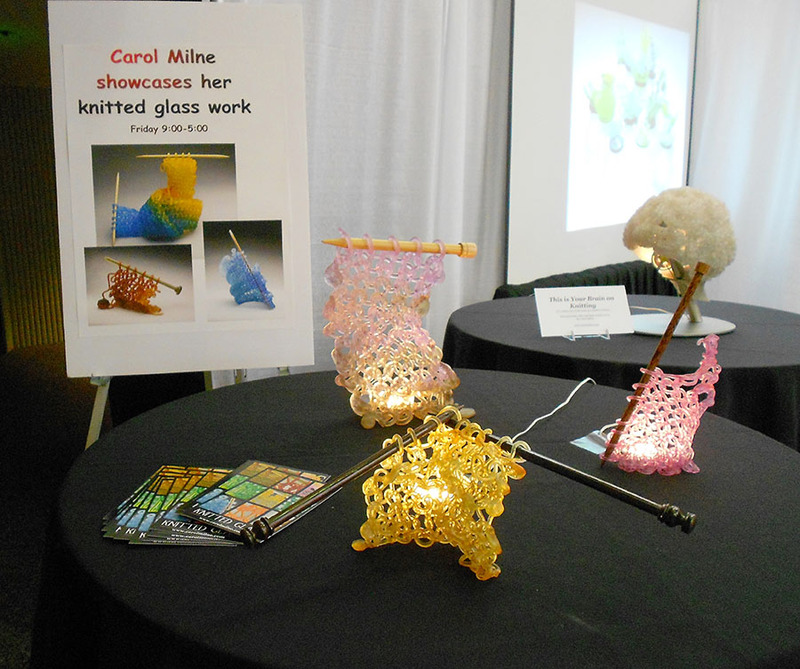 My favorite was watching the lady who produces “knitted glass”. 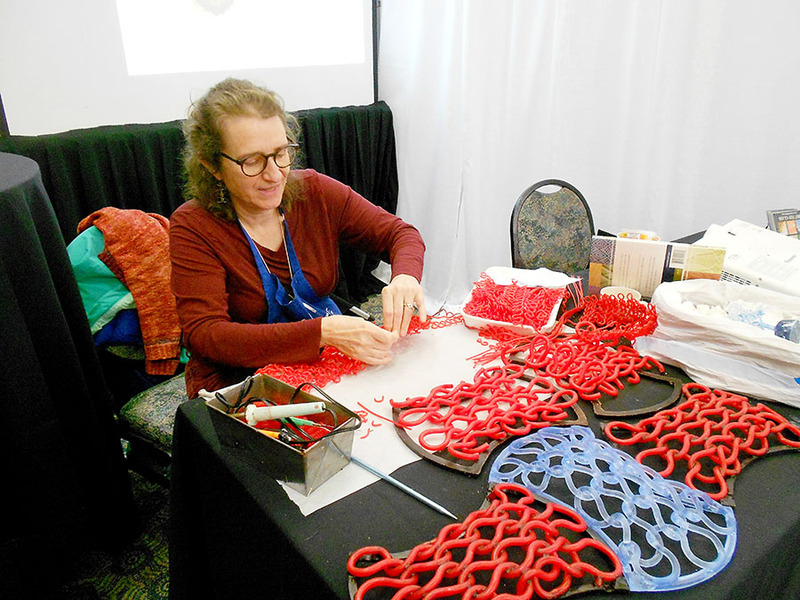 She does it by weaving wax pieces together to form a knitted “fabric”, then forms a mold around the wax, heats the mold to remove the wax, and casts the glass. Yowza! 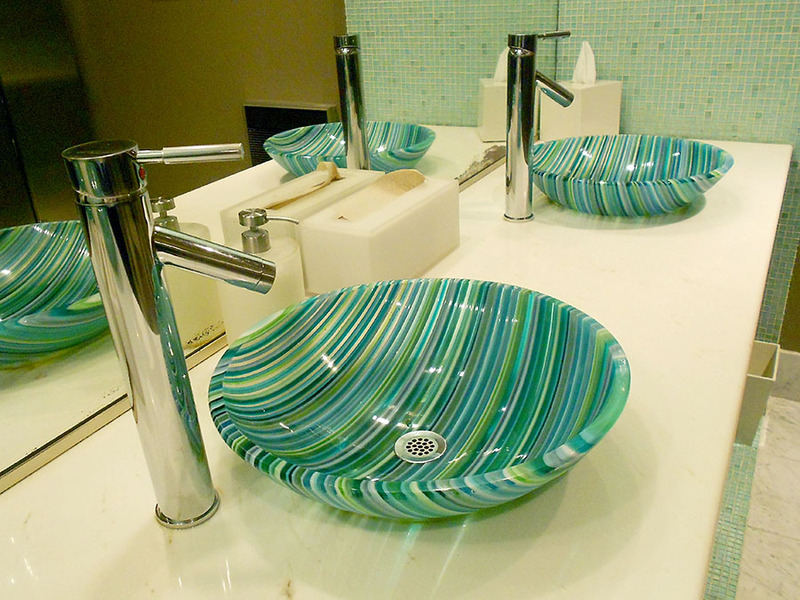 In the photo above, the red is wax, and the light blue piece is glass. The class I was most excited about was six hours learning techniques for constructing traditional gansey sweaters taught by a teacher that my Mom took a class from years ago – what fun! 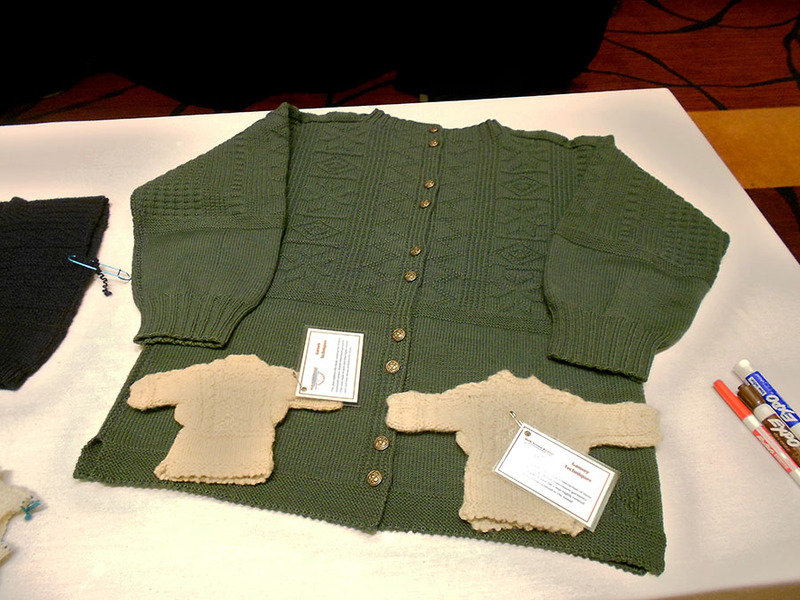 There are a lot of interesting and practical techniques used in this type of British fisherman’s sweater, particularly the cast-on edge, underarm gussets, and the decorative strap that connects the shoulder seams. Each student created a tiny gansey as we worked through all the construction elements, and the lecture was dotted with bits of history. Wonderful! I’m inspired to design a gansey for Jim now, with motifs that reflect where and how we live. 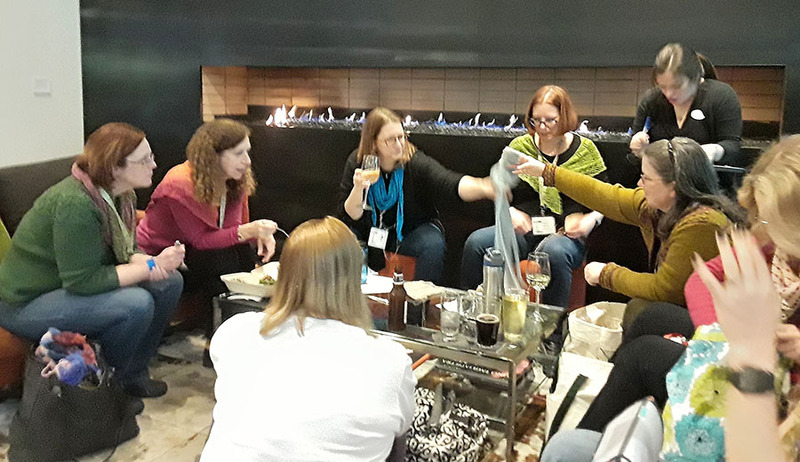 The teacher – Beth Brown-Reinsel – also teaches other types of traditional European knitting styles, and I enjoyed the various samples she had for us to look at. 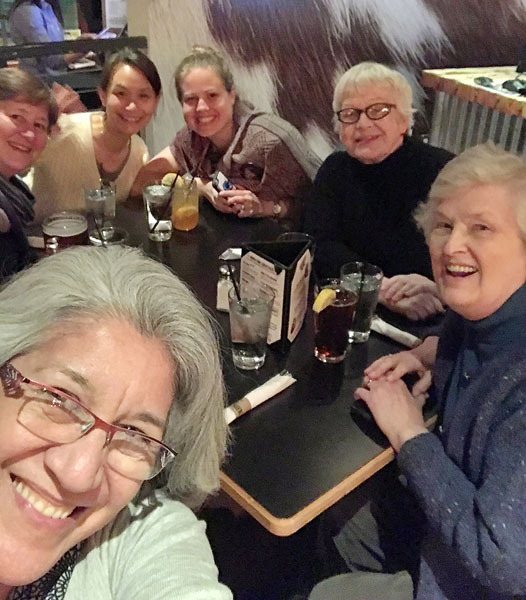 My head is buzzing with inspiration, but my favorite part is the wonderful people I’ve made friends with at these Madrona gatherings – amazing people from all walks of life! 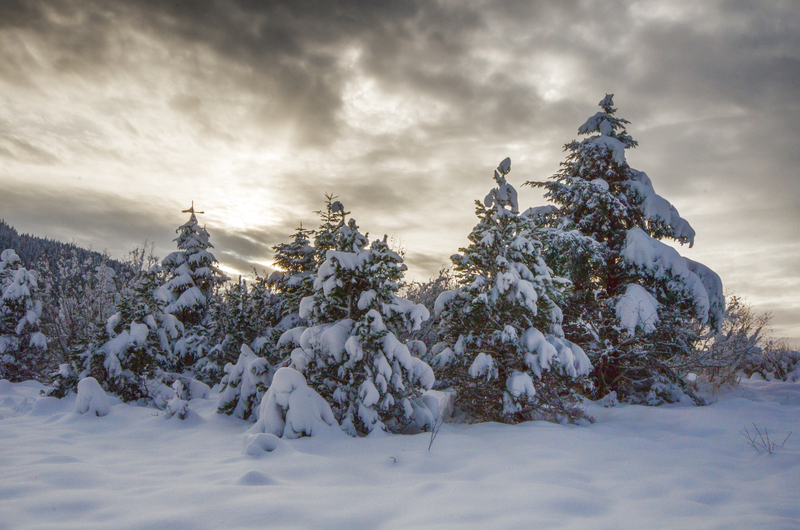 The snow has continued to fall, though we’ve started getting some sunny days now and then. The panoramas are so beautiful throughout the day as the light changes. The sun is still fairly low in the sky, making a shallow arc over the mountains but the days are getting noticeably longer – by over 30 minutes a week. 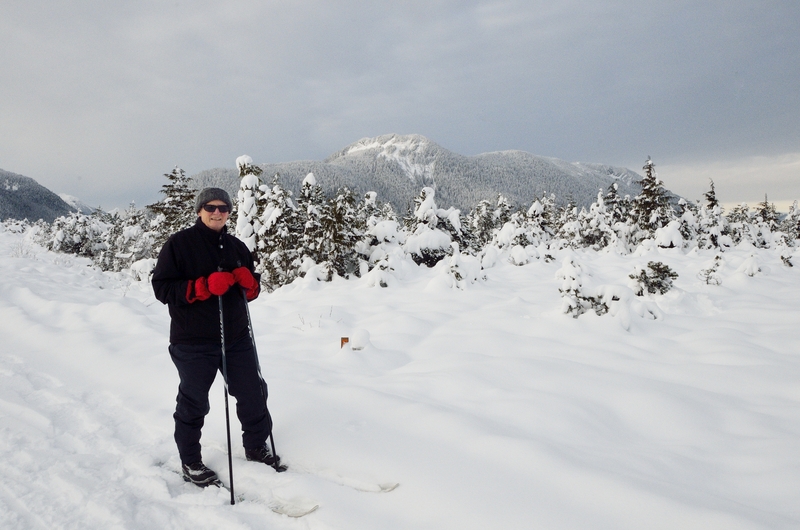 We got out on cross-country skis to explore the area above the airport, enjoying views of the Coastal Mountains, Frederick Sound, and Petersburg Mountain – which you can see in the background behind Jim. 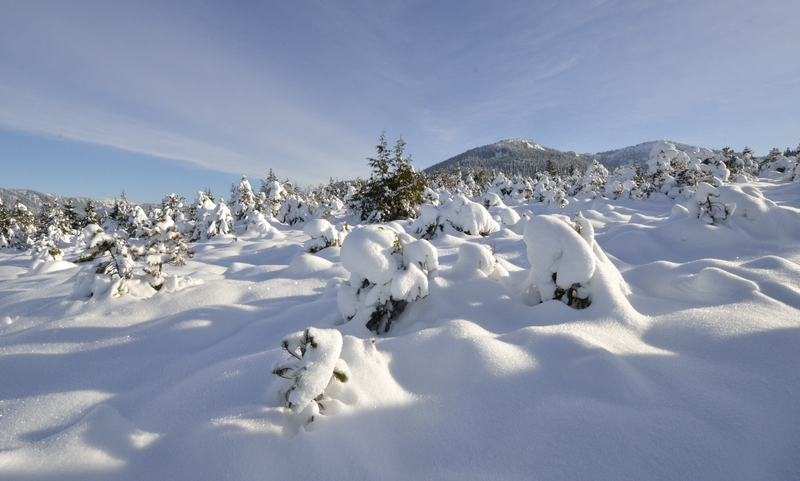 Nothing beats a little fresh air and exercise to counteract the effects of hibernation! Two days after we went skiing we had even nicer weather so I took the snow shoes and more cameras out for another tromp over the snowy muskeg. 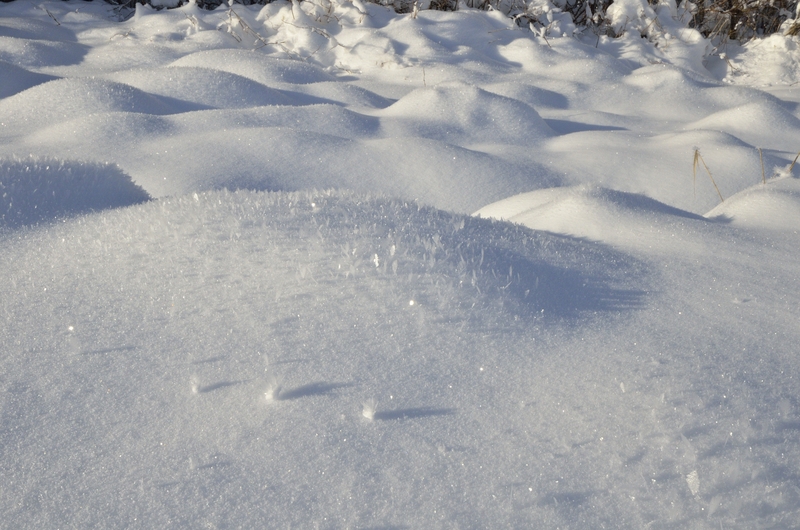 The skies were sunny but it was much colder, and I’ve observed that when temps drop into the teens hoar frost will start to form… like tiny ice flowers. I’ve run out of superlatives to describe the scenery, so I’ll let the photographs speak for me. 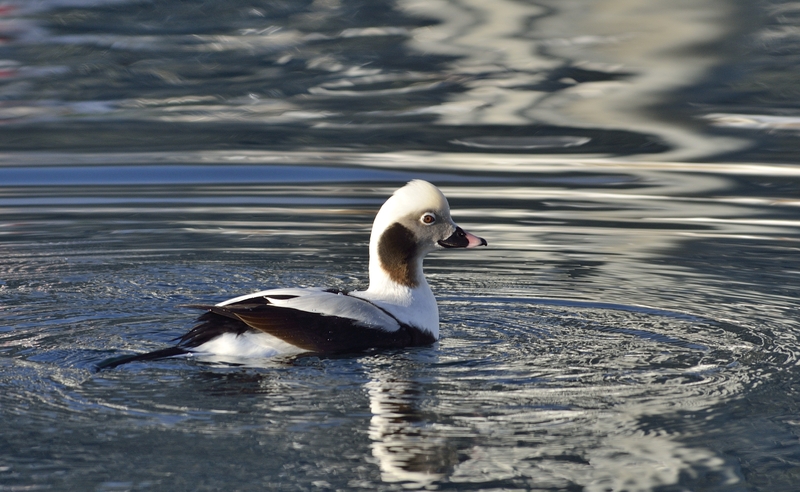 Sunny days also make it nicer for photographing birds in the harbor, and I spotted some wigeons and teals in an area where I don’t often look. 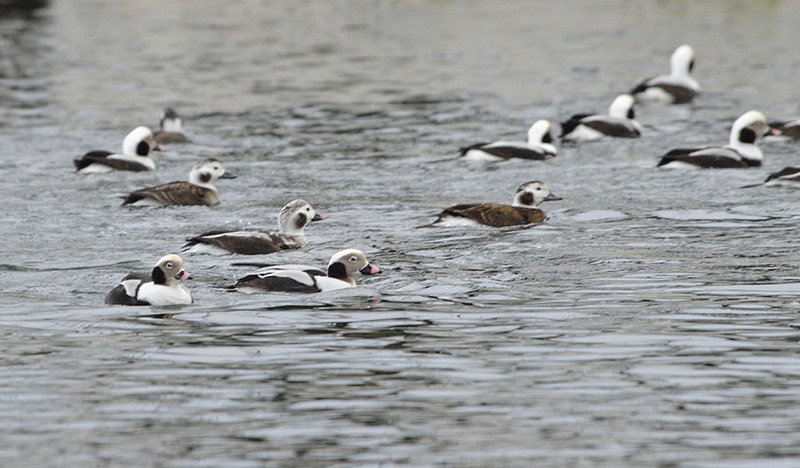 Of course the long tailed ducks are everywhere, making their funny calls as they dive for food. 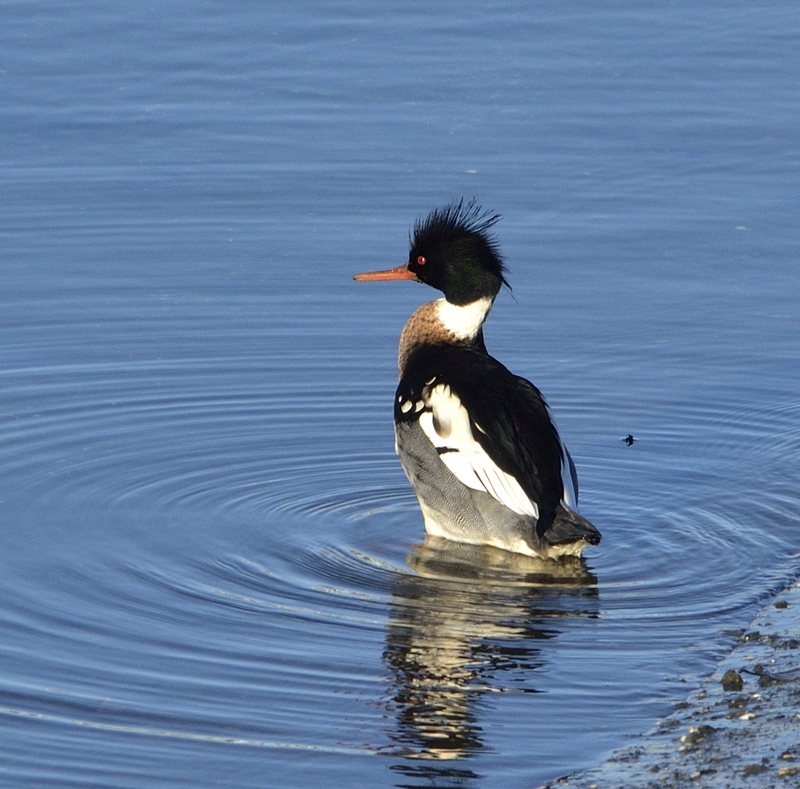 And I found some red breasted mergansers near the docks to the south of us, with their spiky head feathers and red eyes. 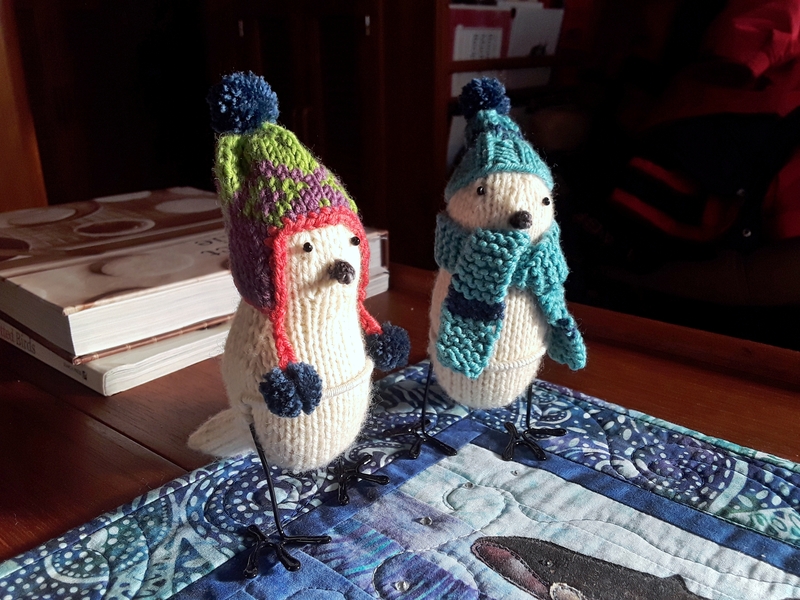 It has been so cold that even the birds are wearing woolly things! 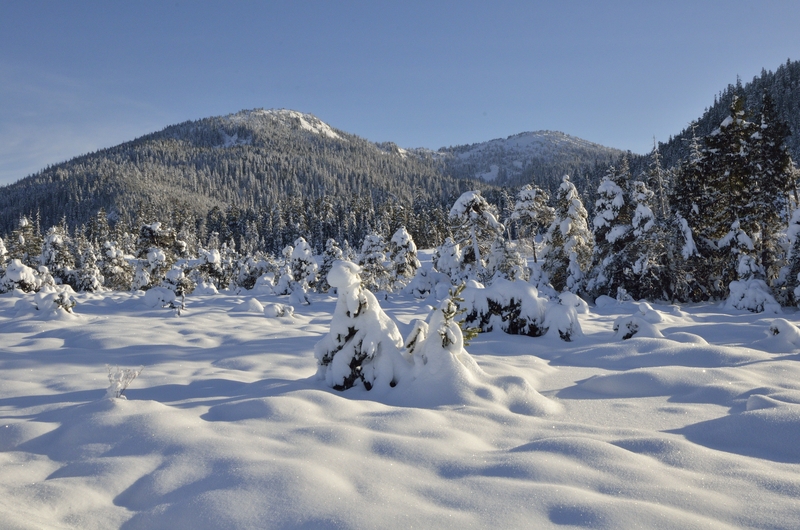 It has been snowing all week here, with just a few breaks in the action… so our world is a very pretty winter wonderland! The first two days of snow were just around freezing so the snow was heavy and wet – snowmen cropped up all over town. 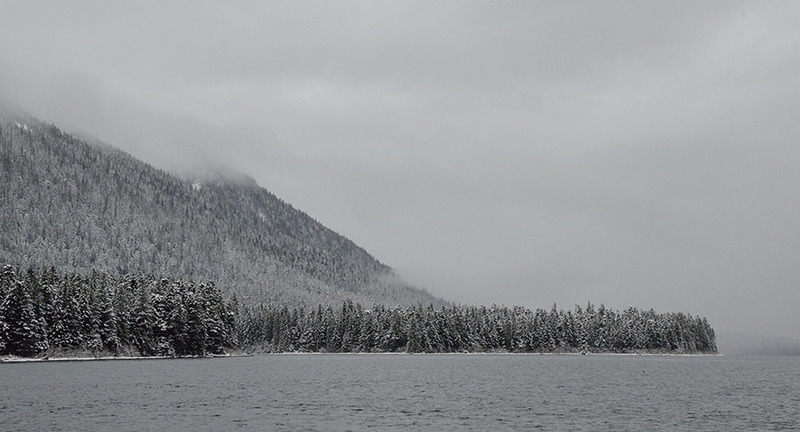 Thankfully the temps dropped a bit and now the snow is fluffy – much easier to shovel or sweep, and we have a little more time to get the accumulation off the very top of the boat before there’s a risk of warmer temps or rain which would increase the weight. Of course school is still in session, though people were hoping for some cancellations so they can get more time to play in the white stuff – taking snow machines up on the logging roads, x-c skis or snow shoes out on the muskeg. The weekend is almost here! In the Lower 48 you have Groundhog Day, but up here today is Marmot Day. Alaska likes to do its own thing. 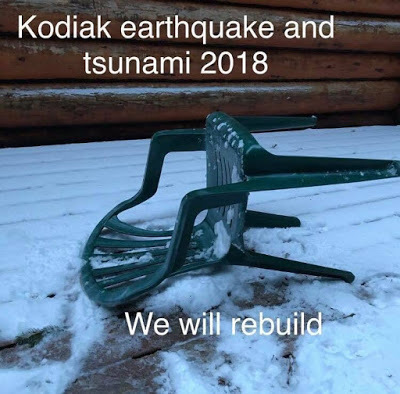 People also have a good sense of humor about stuff like the tsunami warning last week. There has been a lot of discussion about the actual threat of tsunami this week, and the scientific consensus is that a big Pacific wave just can’t make its way back here to us. On the other hand a big earthquake could loosen the face of the nearby Coastal Mountains, and if that happened we’d be inundated pretty quickly. A senior meteorologist from NOAA’s Juneau weather service office gave a presentation Wednesday, and we discussed options for boaters. Even the relatively narrow Frederick Sound close to us would be a safe place to escape a wave since water depth has a great deal to do with surviving a tsunami wave (if we could get out there in time). Let’s hope we never have to find out personally. Suffice it to say that the entire region is breathing a huge sigh of relief that the earthquake turned out to be the horizontal slip type – which doesn’t move much ocean water, rather than the kind that causes tsunami waves – and would have resulted in widespread loss of life in the outer coastal communities. Short daylight and slippery walking makes it easier to hibernate in our snug boat and, in my case, knit like crazy. 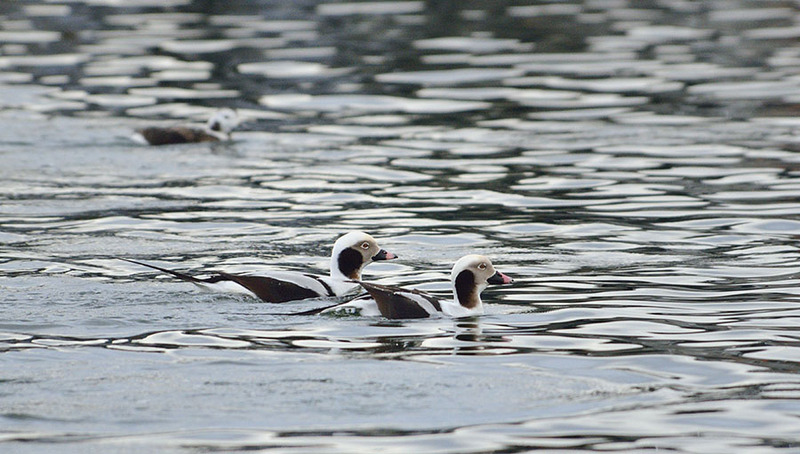 I’ve been lazy and haven’t gotten out to photograph as much as I should… though I did get out to capture some of the long-tailed ducks behind the boat. 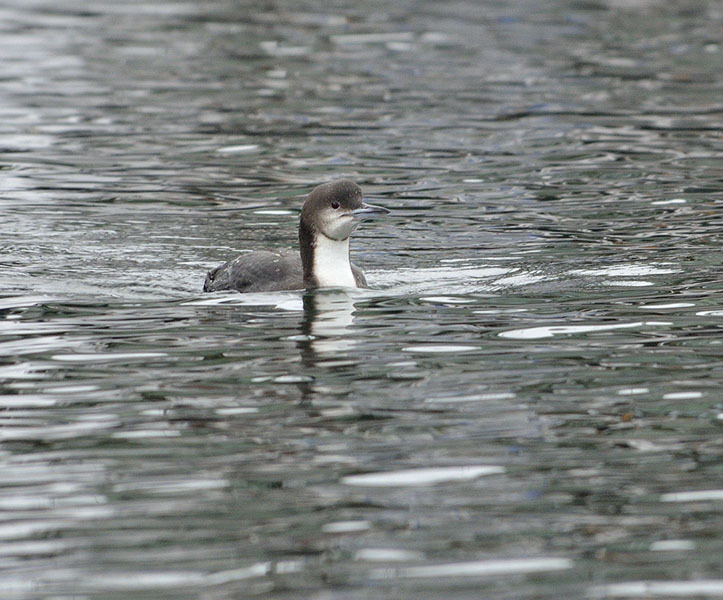 We’ve also had a lot of Pacific loons this winter – more than usual, and they look so different in their muted winter colors. 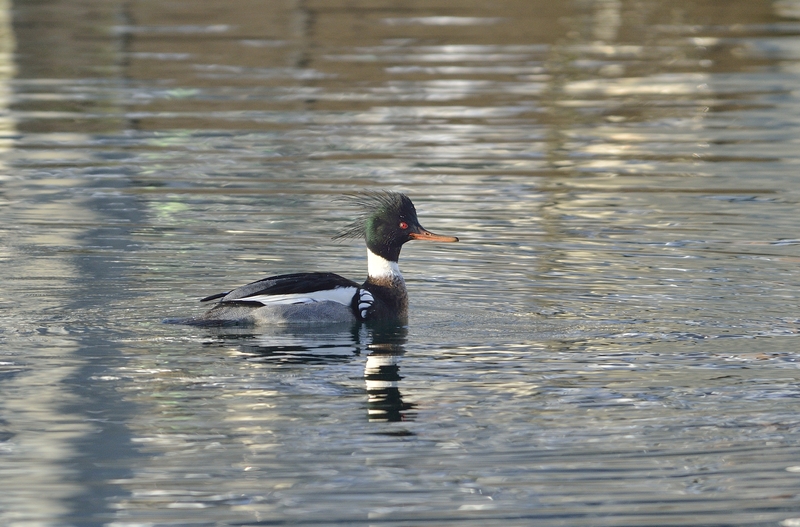 Mergansers and Barrow’s goldeneye, scoters and other diving ducks also fill the harbor, and the resident blue heron tends to sit on the far end of the dock hunkered down and looking less than pleased. We don’t see the sea lions as much since the harbor is fairly quiet, but a friend watched a sea lion wrestle with a 70 lb. halibut the other day, folding it in half and making quite a meal of it. I went over to Sandy Beach Park when the snow was fresh one morning, and found plenty of deer tracks. Our friend who lives fairly close to the park reported finding moose tracks through his yard, and he spotted some very rare lynx tracks on a more remote piece of property along the Sound. 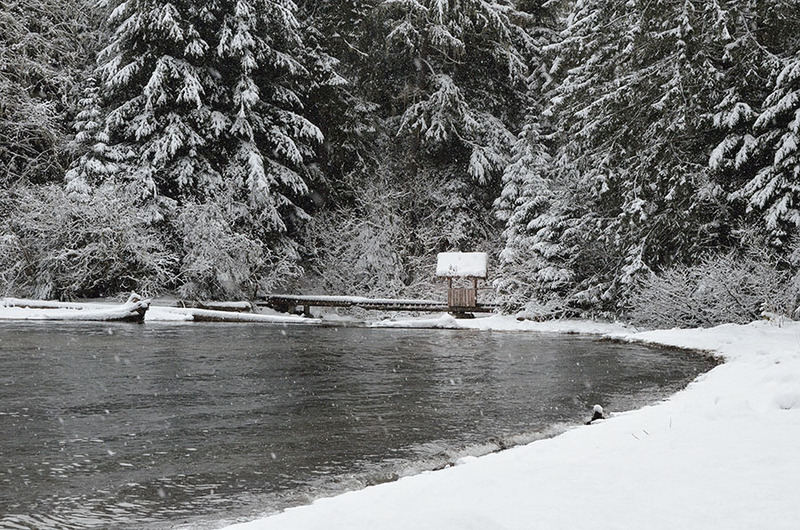 We may not get to see the critters, but the snow tells us a lot about what is moving around. Moose coming this close to town is a real surprise. 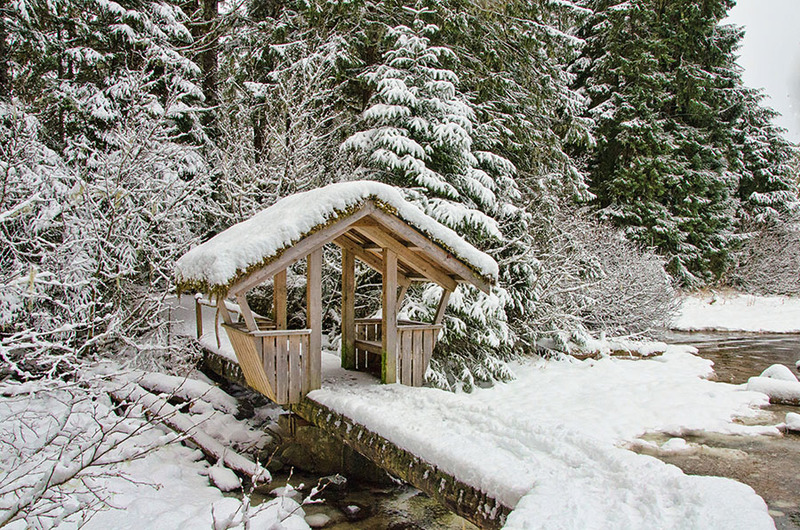 The park has a “troll bridge” built in Scandinavian style, and it looks so pretty in the snow. 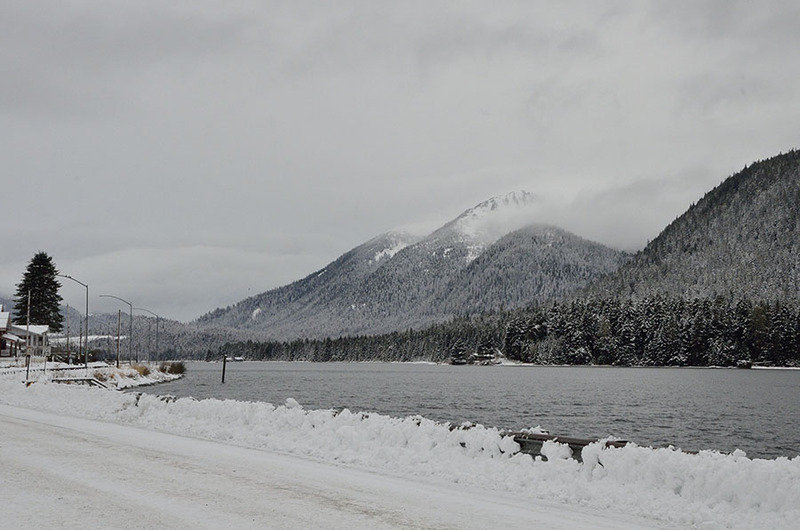 I paused at the point where the Wrangell Narrows meets Frederick Sound, and the views were sublime. This is what we get to see every day, and we never get tired of the ever-changing beauty. The community continues to keep busy with the “Meatball-palooza” pot luck last week, and the traditional Lutefisk Dinner at the Sons of Norway next week. Four of our young men just earned their Eagle Scout medals – which is pretty impressive for a community of only 2500 people. The high school play (a melodrama) had us rolling in the aisles last night, and the two teams our high school sends to the state-wide Ocean Science Bowl in Seward did a great job practicing their presentations for the town this week.